There are loads of eggs during easter - freshly cooked or coloured, chocolate eggs and other sweet delicacies in egg shape. In order that the dainty eggs have an adequate place, you need a suitable eggcup. For those who like to do things with their own hands and be creative we have a very simple instructions for selfmade egg cups, that fit well on the Easter table fit, but also for other spring occasions. Open the pdf or download it and print it. Cut the egg cups with floral motif on the dotted lines and fold together. Thus they are more durable, they can be with clear paint (caution with ink-jet printing, the colours can dissolve) or cover with transparent adhesive film. 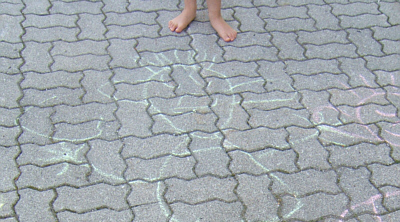 The other two motifs with eggs and bunny can be cut out and painted or painted first, and then cut. And there is of course always room for other ways. Like a little Easter stag, as we did it. Enjoy the creative process and the decorating! 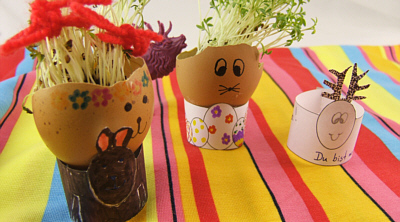 And if you like cress heads for Easter breakfast as well, have a look at the tutorial here.